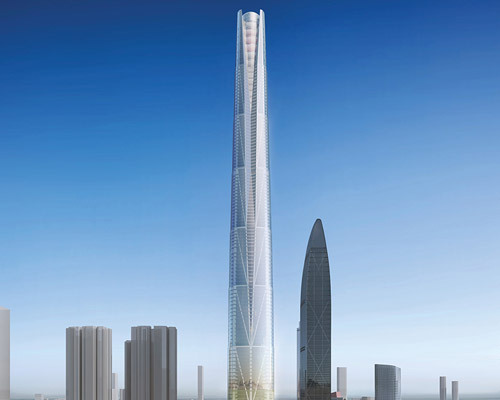 the proposal incorporates two volumes that fuse into a 238-meter-high tower. 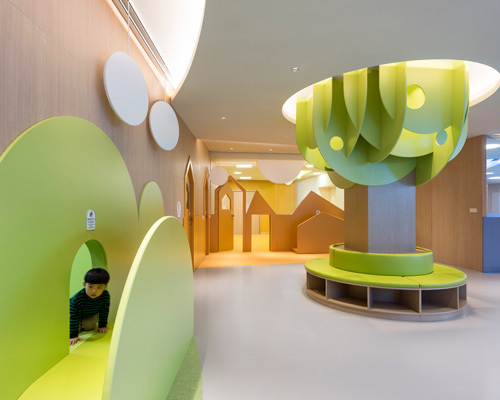 the immersive architectural spaces are designed as stimuli for imagination and learning. sitting on a long and narrow site with strict height restrictions, the building connects the surrounding areas by subdividing the program into separate volumes. marking the gateway to the eastern expansion of the city, the tower serves as a technical and progressive expression to the emerging region. started from the concept of video games world, the architecture was enveloped in a colorful pallet of mapping plains with posters to simulate the effect of a pixelated space. the brief called for a scheme that would invigorate the chinese city's urban fabric while providing the client with a 'visual icon'. 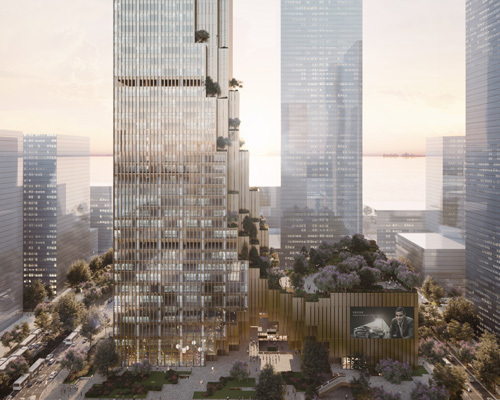 foster + partners' 350-meter tall skyscraper is complemented by a 180-meter high luxury hotel and mixed use tower, retail amenities and green plaza. 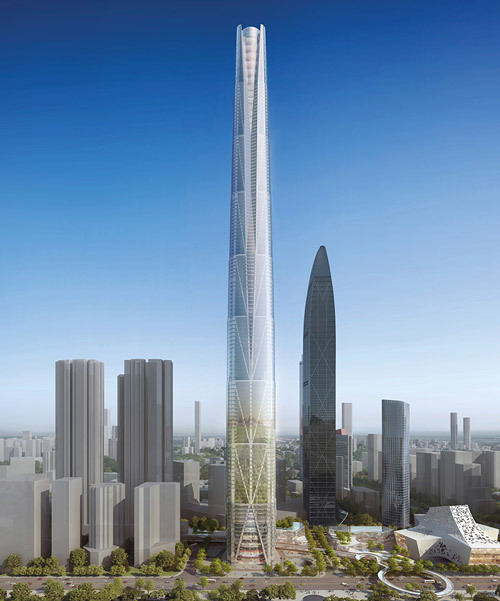 wrapped in a full-façade pixelated screen, the tower bears the image of clouds in the style of a traditional chinese painting by day. the two dwellings leave the site's original architecture untouched, while a new structure is built inside the existing ruins. the building's skin has been developed to maximize sustainable performance and workplace comfort in china's subtropical climate. 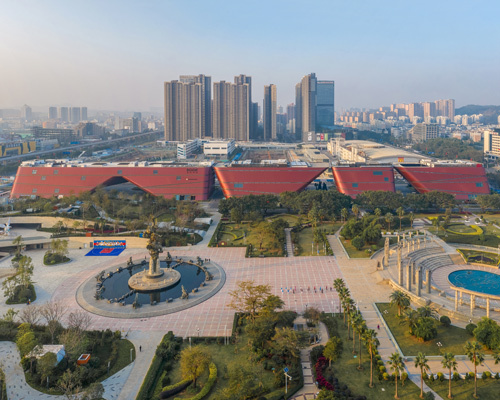 the extension to the existing venues of the park, features a bridge leading through woods and a shape reminiscent of traditional chinese architecture. commissioned by the duo of southern and bosera funds back in 2010, the project was envisioned to contrast any high-rise in the vicinity. developed for DJI, a major chinese technology company, the project is currently under construction in china. the design features community areas, green spaces, and fitness amenities, including a basketball court, a running track, and a pool. 'transfor' showcases the development and transformation of the city from the perspective of urban villages. the flexible structure was built as part of the 2017 bi-city biennale of urbanism \ architecture (UABB). the chinese studio opens the doors of its new office, a transparent and monochromic open space with a sprinkle of industrial design. 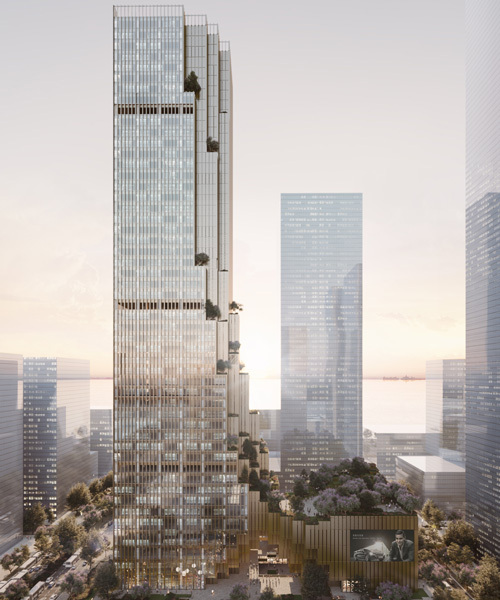 the design seeks to reinvent the high-rise typology and explores different relationships between indoor and outdoor space, and private and public use. there are many electronics factories around shangwei village, shenzhen, china, and this abandoned one at the entrance to the village was one of them. the new aether architects' project is located in nantou village of shenzhen, is part of the urban village space renovation plan. the building designed by fumihiko maki, and houses a new V&A gallery – a collaboration that is the first of its kind between a UK museum and a chinese partner. access to the building has been combined with the entrance to a nearby metro station, resulting in an inviting and welcoming public space. an oceanic theme has been translated from the circular windows that reference ships, to the brise-soleil on the façade which has been organized according to the sheet music from 'ocean' by the debussy. perforated plates and stone extend and twist across MOCAPE in shenzhen, prompting the use of an innovative type of lighting design. 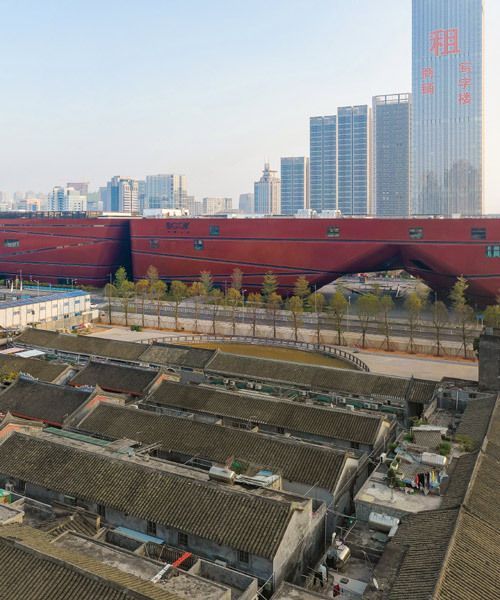 designed by japanese architect fumihiko maki, the museum seeks to connect china to the world, fostering connections between design and society, everyday life, and industry.